From the Baldwin County Courthouse, go west on Hancock St. which becomes Highway 49 and follow Highway 49 south for approximately 9.7 miles from the Courthouse. Turn left onto County Line Church Rd. Travel 1.9 miles. Bear right on CC Camp Rd and go 0.8 mile. Turn right on Union Hill Church Rd and go 1.6 miles to a woods road on the left. Follow the woods road for 0.8 mile to a fork and bear right at the fork on what was called Water Heater Trail in 2009. Continue another 0.4 mile for a total of 1.2 miles from the beginning of the woods road. 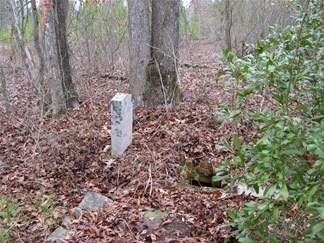 The graveyard will be on your right about 75 feet from the road, in the woods. It is not easily seen from the road. Wife of Andrew J. Hall. Mar'd Jan 9, 1851, per genealogy of Sammy Hall. 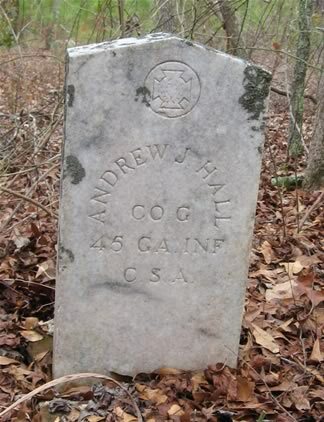 Grave identified from info passed down to Sammy Hall, gr gr grandson.